Cat stuck in a tree? Can’t it get down on its own? 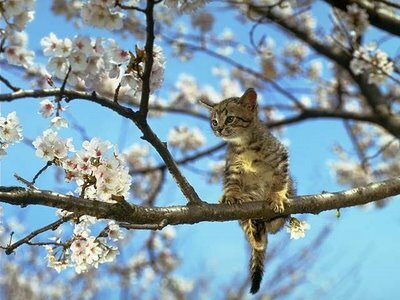 We generally think of cats as natural tree climbers. A common belief is that if the cat can get up a tree, it can get down. But, this is not necessarily true. When cats becomes stuck in a tree, it’s important to get them down as soon as possible. In as little as a day, a stuck cat can get dehydrated and weak. And, there is always the threat that the cat will fall prey to a predator. If you are unable to get the cat down on your own, it important to know who to call for assistance. Please do NOT call your local fire department – their mission is to save human lives and property. They do not rescue cats. The Humane Society of Indianapolis and Indianapolis Animal Care and Control (IACC) also do not rescue cats from trees. DO contact a local tree company – they will have the training and expertise to safely climb a tree and retrieve a frightened cat if you can not get the cat down yourself.